Cheap batteries behind e-bike fires? The increasing number of fires this year involving personal mobility devices (PMDs) and electric bicycles could be due to cheap batteries used in some devices. Three such fires were reported over the past month, with two happening this week alone. In Tuesday's fire, 23-year-old deliveryman Ridwan Ithnin suffered burns to 45 per cent of his body after an e-scooter exploded in his Yishun flat. Last month, a family had to escape through their bedroom window with a five-day-old baby after an e-bike charging overnight in the common corridor of a Bukit Batok Housing Board block caught fire. 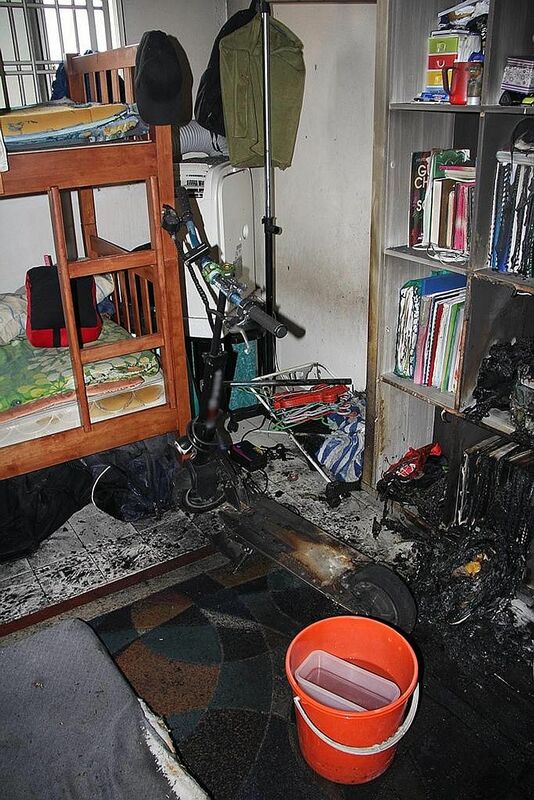 These incidents have raised serious concerns over whether PMDs and e-bikes are fire hazards. According to the Singapore Civil Defence Force (SCDF), there were 31 fires involving PMDs, such as e-scooters, and e-bikes, between January and September - up from just 19 over the same period last year. One reason for the jump could be the proliferation of cheap PMDs for sale online. A search on e-commerce sites like Carousell and Taobao turned up hundreds of results, with several priced as low as $200. Batteries from reputable manufacturers such as LG and Samsung can easily cost between $200 and $300, said Mr Denis Koh, chairman of PMD enthusiast group Big Wheel Scooters Singapore. "Something's got to give if you can get a whole e-scooter for that price," he added. In contrast, cheap "unbranded" batteries can cost as little as $60, said Mr Victor Lee, general manager of PMD retailer Falcon PEV. "On the whole, branded batteries do have better quality and they handle heat and stress better," he said, adding that heat is one of the main causes of electronics failure. Government Parliamentary Committee for Transport deputy chairman Ang Hin Kee urged e-bike and PMD users to purchase their devices from approved sources for a "greater assurance of safety". But Mr Koh cautioned against pointing the finger at unbranded PMDs, highlighting that other factors such as water damage or illegal modifications could be at fault. Dr Soh Chew Beng, deputy director of the electrical power engineering programme at the Singapore Institute of Technology, said while lithium-ion batteries - such as those used in PMDs - are generally safe, there could be a higher risk of battery failure for PMDs and e-bikes. This is because the battery cells are subjected to external factors such as high humidity, dust, and vibration, said Dr Soh. Overcharging is another factor, said Mr Lee. While batteries with protection circuitry should stop charging once full, faulty batteries or those of poor quality may not, he said. He added that PMD users should try to find out the make of battery in their devices, and see if the adaptors have Spring Singapore's Safety Mark. In a Facebook post on Wednesday, the SCDF reminded PMD users not to leave their devices to charge overnight, to place batteries on hard flat surfaces when charging to allow heat to dissipate, and not to place the battery being charged near combustible materials. While it is difficult to pinpoint the exact reason behind the increase in the number of fires, Mr Koh said users must take precautions to avoid having their devices go up in flames. "Even one fire is one too many."